* And of course, as a subscriber, if you need to change your night, you can. This package offers the most flexibility. You buy four tickets at a discounted price and use them in any combination during the season. PLUS you’ll receive all the subscriber benefits listed above including a discount on the purchase of most additional tickets. * While you can buy Nutcracker and Sølvi Edvardsen’s Man tickets at a discounted price, you can’t redeem any of your four Flex Pass tickets for Nutcracker tickets. You can get a deeply discounted subscription with a Night Moves Membership for 156 dollars, or only 189 in A-category seating – that’s 60 dollars off the regular A-category subscription. PLUS, you’ll be invited to exclusive after-parties. Meet and mingle with the dancers and company, sample specialty cocktails, and dance to the live mix by a talented DJ. Just call the box office 250-386-6121 to book & pay for your tickets, and then pick them up on the night (or earlier if you prefer.) You’ll also need to provide your email address when you purchase your tickets so we can send you the party details! Restrictions: Night Moves tickets are available for second night performances only (Loge and Premium seats excluded); there are no refunds; if you need to exchange a ticket to Friday night, you will have to pay the Adult Subscriber price as Night Moves tickets are not available on Fridays; you must show photo ID when you pick up your tickets. Night Moves tickets only available in-person or by phone order. Buy an adult ticket (in Category A or B section) & pair it with a discounted Pay Your Age ticket or Night Moves ticket. Bring your favourite young person to the theatre, ensure you have seats side by side, and experience an inspiring evening of dance together. * Dance Duo packages for the 2018/19 season are available starting Sep 4, 2018.
exchange tickets from one show date to another in person at the box office. exchange tickets from one production to another in person at the box office. return tickets and donate the ticket amount to Dance Victoria at the box office. ** Single tickets for the 2018/19 season are available to non-subscribers starting Sep 4, 2018. There are 50 tickets per performance available at 29 dollars – all in Section C. These seats have a more limited view of the full stage, but make a night out at the theatre more affordable. * These seats are not available in a subscription package and are not available for Sølvi Edvardsen’s Man and RWB’s Nutcracker. “Like” Dance Victoria’s Facebook page to stay in touch with Pay Your Age & other DV announcements! *You may also want to sign up to receive occasional PYA emails here. Pay Your Age tickets are available by phone or in person (no web sales). You must provide proof of age at pick up. Subject to a 5 dollar box office handling fee. If a Night Moves membership doesn’t work for you, you can still become a Night Mover for a single Saturday performance. You still get a deeply discounted ticket price, PLUS, you’ll be invited to exclusive after-parties. Meet and mingle with the dancers and company, sample specialty cocktails, and dance to the live mix by a talented DJ. All MainStage performances are at the Royal Theatre, 805 Broughton Street, Victoria, BC V8W 1E5 (located on the corner of Blanshard Street and Broughton Street), except for Sølvi Edvardsen’s Man which performs at McPherson Playhouse, Pandora & Government Street. 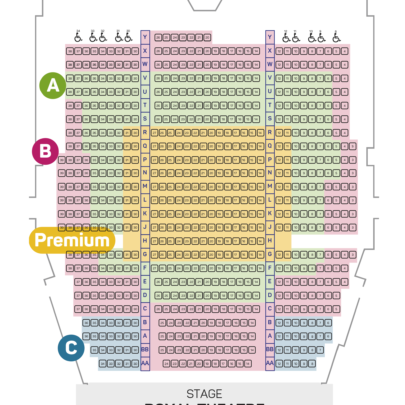 For an overview of the Royal Theatre Subscription Season seating plan, click here. 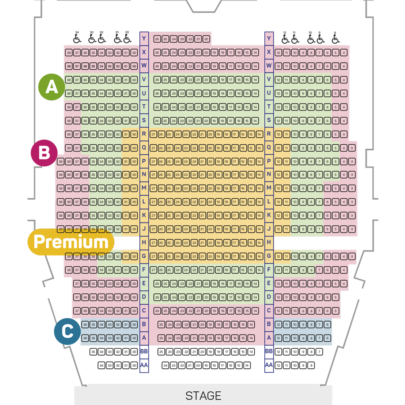 For an overview of Nutcracker seating plan at Royal Theatre, click here. 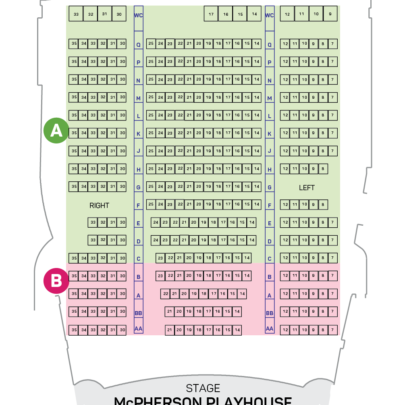 For an overview of Sølvi Edvardsen’s Man seating plan at McPherson Playhouse, click here. Latecomers and those who exit during the performance will be seated at an appropriate break. In consideration of other audience members please avoid the use of scented products. We all share the air! Camera, audio and visual recording equipment is prohibited. There is no outside food and drink allowed into the theatres. Both the Royal & McPherson have licensed bars and concessions, which accept cash and credit cards. The theatre lobby will be open one hour prior to the performance start time and entrance to the house will be one half hour prior to the performance start time. The Royal Theatre & McPherson Playhouse are equipped with the Sennheiser Hearing Assistance System. To obtain a headset please visit the concession. You will be required to leave a piece of identification which will be returned to you when you return the headset. The Royal Theatre has binoculars available. To obtain a pair please visit the concession. You will be required to leave a piece of identification which will be returned to you when you return the binoculars. In the great tradition of the theatre, Dance Victoria holds close to the maxim, “The show must go on!” Dance Victoria is committed to honouring its performance schedule and does not cancel performances due to weather conditions. If patrons cannot attend a performance, for whatever reason, they may donate tickets back to Dance Victoria and receive a charitable donation tax receipt for the full amount. This must be done by contacting the Royal & McPherson Box Office at 250-386-6121 at least 24 hours before show time. All ticket sales, including tickets for Nutcracker are final. There are no refunds or exchanges. If patrons cannot attend a performance, for whatever reason, they may donate tickets back to Dance Victoria and receive a charitable donation tax receipt for the full amount (less service charges). This must be done by contacting the Royal & McPherson Box Office at 250-386-6121 at least 24 hours before show time. Everyone entering the theatre must have a ticket, including babes in arms. Price is no longer an issue! Now you can see the world’s best dance for only 29 dollars. We’ve allocated 50 seats for every performance at the unbelievable price of only 29 dollars. Not a subscription package. Not available until Sep 4, 2018. If you are between 12-29 years old, you can pay your age. Advance sales only per performance. Call or go to the box office in person. Not available until Sep 4, 2018. If you are 30-45 years old, you can become a Night Mover for 54 dollars per performance (or only 60 dollars in A-category seating)! Limited to second night performances. No refunds or exchanges. * Phone or In person sales only. Available until sold out. Night Moves Members have their pick of seats (Loge and Premium excluded) for the all-in price of 156 dollars (or only $189 in A-category seating). Plus, members receive invites to exclusive after parties. * Phone or In person sales only. 2019/20 Subscription Season brochure available here. • Interested in buying a subscription package for 2019/20? Please phone or visit the Royal & McPherson Box Offices, or purchase online, starting 10am April 15 and learn more about the many subscription types. • Box offices are open Monday through Saturday, 10am – 5pm. McPherson Box Office (Pandora at Government) or Royal Box Office (Broughton at Blanshard). Questions? Dance Victoria Administration 250-595-1829.